It only uses the principles of animal behavioural response patterns to communicate the clear message or threat that the fox is not welcome. Please note, this product will also deter dogs. Power supply is 1 x 9v Duracell alkaline battery (not included) or optional mains adaptor kit. Every year foxes commit untold damage to thousands of homes and gardens not only by fouling and digging up bulbs and vegetables but by building their earths in and around sheds, cellars, decking, drains and houses or even drains or lofts. Given an open window or doorway they will brazenly steal not just food but any item that takes their eye including clothes and children’s toys. Foxes are natural born killers – even when they are not hungry they will instinctively kill any small domestic pet or wildlife including rabbits, guinea pigs, small birds, ducks, chickens and fish as a matter of course. A stoutly built cage is no guarantee of defence against a determined fox. As they forage for food foxes will destroy many man- built structures including wood, metal wire, etc and, of course, rip dustbin liners to shreds leaving an unsightly trail of rotting rubbish. Foxes carry and spread many diseases harmful to man and other animals including Weils disease (leading to possible organ damage/ failure); Toxocariasis (causing blindness in children) and Sarcoptic Mange which is easily transmitted to domestic dogs causing skin irritation, loss of fur, possible death and expensive vets bills. Foxes also continually mark their territory with scent, urine and faeces presenting a considerable health risk to adults and children alike. As many people know foxes nocturnal activities can be just as intrusive and the penetrating screams of foxes mating or fighting has ruined many a good nights sleep. 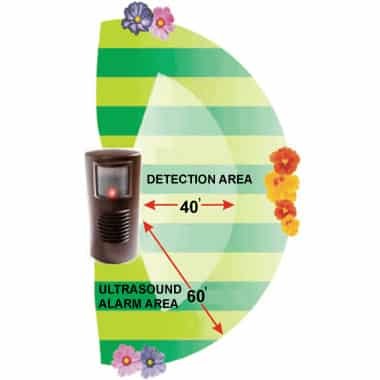 One Foxwatch unit will protect an area of up to 1,350 sq. ft.
Foxwatch is the most successful fox deterrent ever invented. And the reason is simple. Only uses the principles of animal behavioral response patterns to communicate the clear message or threat that the fox is not welcome. Uniquely, each time the fox approaches its body heat and movement are detected and activate an ultrasound alarm (calibrated to be extremely loud to foxes ears but inaudible to humans). As the fox retreats the alarm stops and in this way the fox learns to associate its movement with the noise and give a wide berth to the protected area of over 1,350sq ft. Other fox deterrents do not do this. They simply emit a random or permanent ultrasound signal regardless of whether a fox is present or not. As a result any passing fox soon realises the constant sound of the alarm is not caused by them and therefore becomes immune to its effects. This breakthrough concept was first developed in 1993 when the latest advances in electronic microchip technology allowed the established conditional response patterns of animal behavioral science to be applied in this unique way. 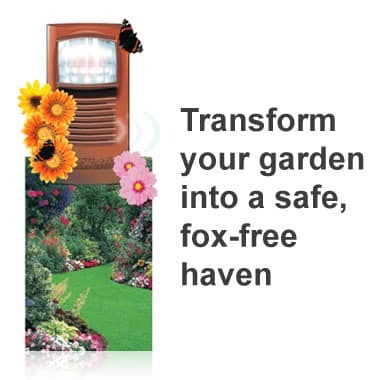 Foxwatch is designed to run trouble free all year round and in all weather conditions from -30° C to +60° C. The low voltage computer controlled micro circuitry is completely sealed inside the unit so that in the unlikely event of water entering inside – it will still continue to function and be absolutely safe to touch. Years of painstaking research have resulted in the development of a unique ultrasound frequency pattern which deters foxes from entering gardens even when they contain a rich variety of food sources such as provided by flower beds, vegetables, fishponds, compost heaps & dustbins. Foxwatch can be moved and positioned at ground level in seconds or secured at the base of walls, fences and trees. Simply clip in a battery (not included) or use the optional mains adaptor kit, then switch on and relax. Requires 1 x 9v Duracell alkaline battery. Average battery life is 2 – 3 months. Note: We do not recommend the use of re-chargeable or cheap batteries as the functionality will be greatly impaired. Most animals like ourselves cannot hear the Foxwatch alarm, this includes birds, frogs, hedgehogs and rabbits. Dogs can hear the alarm and will be deterred from entering the protected area. 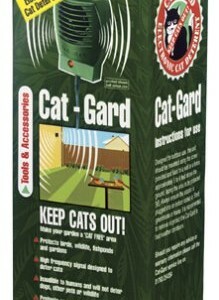 Gardman Cat-Gard Limited Stock !! 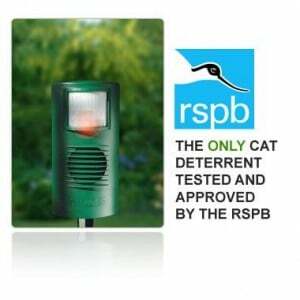 CATwatch – RSPB APPROVED CAT DETERRENT.